Brown has expressed a desire to stay in Baltimore, but he also wants to play in an offense that takes more shots downfield, Jeff Zrebiec of The Athletic reports. Brown caught 42 of 97 targets for 715 yards and five scores in 16 games for Baltimore in 2018. Brown (hamstring) is active for Sunday's Week 17 tilt against the Browns. Analysis: As expected, Brown will be out there for the Ravens after practicing in full Friday. The receiver's active status isn't a surprise considering the importance of the contest for Baltimore, which needs a victory to ensure a postseason berth. 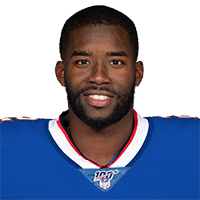 Brown (hamstring), who is listed as questionable for Sunday's game against the Browns, is expected to play, Adam Schefter of ESPN reports. Analysis: Brown was a full participant at Friday's practice, so his availability for Week 17 always seemed to be a likely outcome. The wideout probably won't make for an appealing option in fantasy lineups after averaging just 18.8 yards per game over his last eight outings. 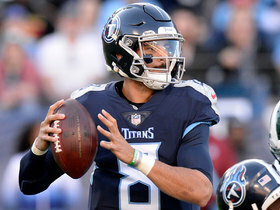 Brown (hamstring) is listed as questionable for Sunday's game against the Browns, Jamison Hensley of ESPN.com reports. Analysis: Given that Brown practiced fully Friday, we'd expect him to be a go Sunday. 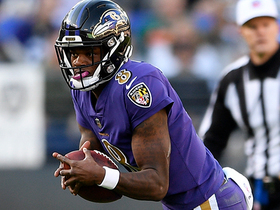 While the Ravens have gone 5-1 since Lamar Jackson took over at QB, Brown's fantasy value has taken a corresponding hit, with 27 receiving yards representing his highest total in that span. Brown (hamstring) was a limited participant in Thursday's practice, Jamison Hensley of ESPN.com reports. Analysis: With playoff implications on the line Week 17 against the Browns, Brown seems likely to get the green light to play in the contest if he can at least maintain limited participation Friday in the Ravens' final practice session. 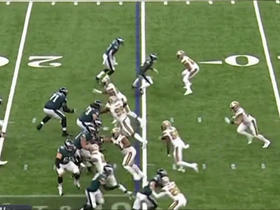 Even if Brown gains clearance for the weekend, he wouldn't make for an overly appealing fantasy options. In Lamar Jackson's six starts under center, Brown has topped out at two receptions and 27 receiving yards while scoring only once. Brown was held out of Wednesday's practice with a hamstring injury, Jamison Hensley of ESPN.com reports. Analysis: Brown has played in every game this season, but he has a lengthy injury history that includes multiple incidents with his hamstrings. It's unclear if this is a matter of maintenance or legitimate cause for concern regarding his availability for Week 17 against Cleveland. Whatever the case, Brown has caught just seven passes in six games since Lamar Jackson took over as the starting quarterback. His early bid for a 1,000-yard campaign has gone up in smoke. Brown caught two passes (six targets) for 27 yards in Saturday's 22-10 win over the Chargers. Analysis: Brown continues to struggle developing any sort of rapport with Lamar Jackson. The veteran wideout is averaging just 1.2 receptions and 17.8 yards per game with Jackson under center, compared to 3.8 catches and 66.8 yards per game with Joe Flacco. 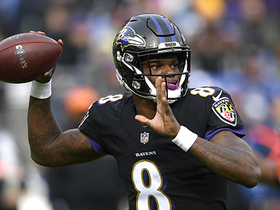 The Ravens have turned their season around in a positive way since the quarterback change, so the days of Brown being a relevant fantasy receiver are -- just like Flacco's starting job -- gone for the rest of the season. Brown brought in one of three targets for nine yards in the Ravens' 20-12 win over the Buccaneers on Sunday. 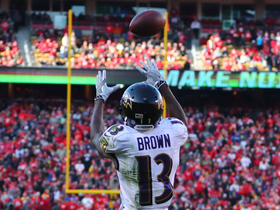 Brown caught two of six targets for 23 yards and a touchdown in Sunday's 27-24 overtime loss to the Chiefs. Analysis: Brown hit paydirt for the first time since Week 7, but he's still caught just four passes for 71 yards on 14 targets in four games with Lamar Jackson (ankle) starting at quarterback. 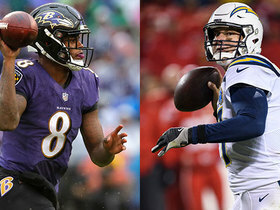 A friendly Week 15 matchup with Tampa Bay probably won't make much of a difference unless Joe Flacco (hip) ends up starting. Brown was held without a catch on four targets against the Falcons. Analysis: Brown's downturn since the bye week bottomed out in Week 13 as he was held without a catch for the first time all season. Since Lamar Jackson took over at quarterback, Brown has a grand total of two catches for 48 yards on 12 targets. Baltimore has shifted to a ground-heavy approach overall under Jackson, so the target pie has shrunk. But even with that, Brown's role relative to other Baltimore pass-catchers is diminishing him in a way that's making him a nonfactor in fantasy. Brown hooked up with Lamar Jackson on just one of seven targets for a 25-yard gain during Sunday's 34-17 win over the Raiders. Brown gained 23 yards on his single target and did not gain any yardage on his lone carry during Sunday's 24-21 win over the Bengals. Brown caught three of six targets for 15 yards in a 23-16 loss to the Steelers on Sunday. 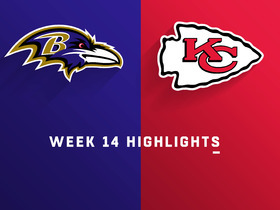 Watch the wild Week 14 game between the Baltimore Ravens vs. Kansas City Chiefs. Baltimore Ravens rookie quarterback Lamar shows touch on touchdown on pass to John Brown to give Ravens late lead. NFL Network's "NFL Fantasy Live" crew spotlights players whose fantasy stocks are rising or falling heading into Week 14. 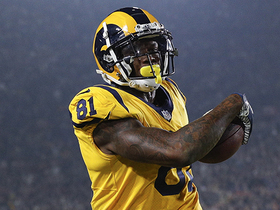 NFL Fantasy Live analysts breakdown the reasons why you may have lost Fantasy in Week 11. 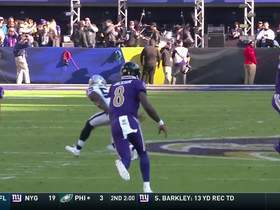 Baltimore Ravens rookie quarterback Lamar Jackson improvises for big completion of 23 yards before half. 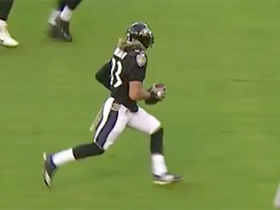 The Baltimore Ravens' last-second lateral attempt comes up short.